Question: What is the difference between Baking Soda and Baking Powder? Answer: Baking Soda: Pure Sodium Bicarbonate. When combined with both moisture and an acidic agent (honey, buttermilk,etc.) it produces bubbles that help your dough to rise. The action starts immediately and so you need to bake the dough immediately after adding adding the baking soda or else it will fall flat! Baking Powder: Contains Sodium Bicarbonate, but also contains the acidifier (cream of tartar) and also a drying agent(corn starch). It too must be baked immediately. Q: Why do some recipes call for one or the other? 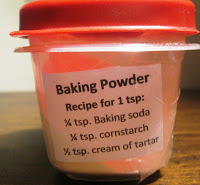 A: Whether you use soda or powder depends on the other ingredients in the recipe. Baking powder contains both the acid and the base so it already has a neutral effect as far as taste goes, so it is more commonly used when the other ingredients in the recipe are also neutral tasting such as regular milk. Q: Can you substitute one for the other?